Handy/Intuitive: meet new top bar menus that can be easily adapted to your needs – you can put most often used menu sections to the front. 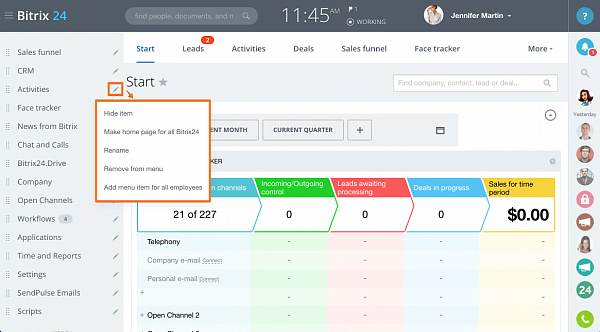 Personalized: customize all menu bars as you like – reorder, hide items, add Bitrix24 sections to the left-side menu, add custom menu items, and save menu design for all portal users. 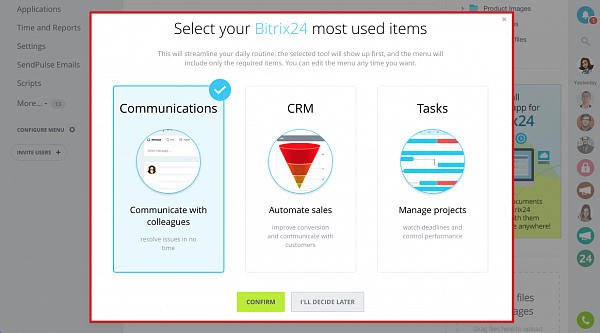 Adaptive: select your Bitrix24 most used items - communications, CRM or tasks. Help your employees to adapt to Bitrix24 faster - choose what Bitrix24 tools you need, then add left-side menu items & configure home page for all users of your Bitrix24 account. 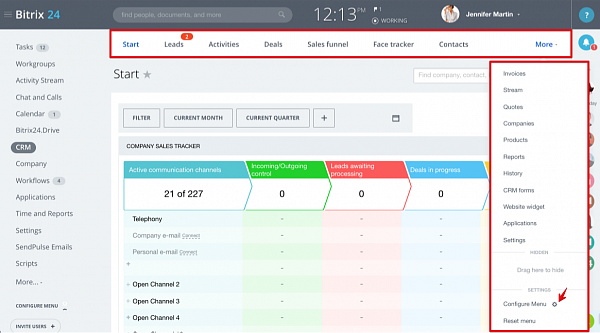 This option will streamline your daily routine: the selected tool will show up first when you open your Bitrix24, and the left-side menu will include only the required items. 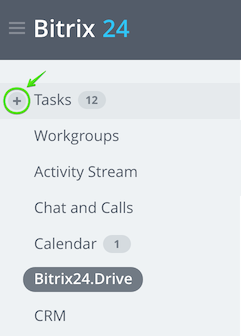 You will be shown this menu widget when you open your Bitrix24 for the very first time but will be able to change your primary tool later on as well: Configure Menu > Reset Menu. Important: this option is available for Bitrix24 account administrators only and will change Bitrix24 interface for all account users. - Now left-side menu can be completely hidden and you automatically extend your workspace by about 20%. You can easily access all available menu options with the help of new menu top bar widget. Drag & drop or hide menu items to get own personalized menu view. Drag & drop most often used Bitrix24 page to the top of your left-side menu to make it your own start page. Use Favorites icon to add any Bitrix24 page to the left-side menu. 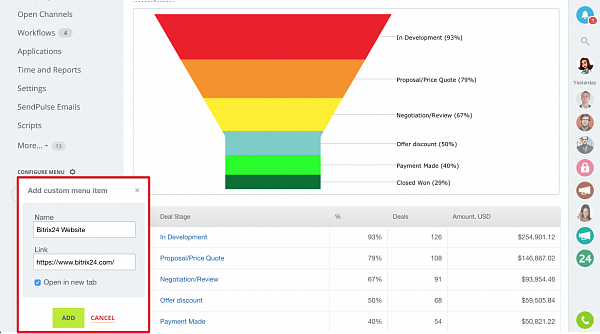 Add favorite page listed in your left-side menu item for all employees. Set selected page as home page for all Bitrix24 account users. 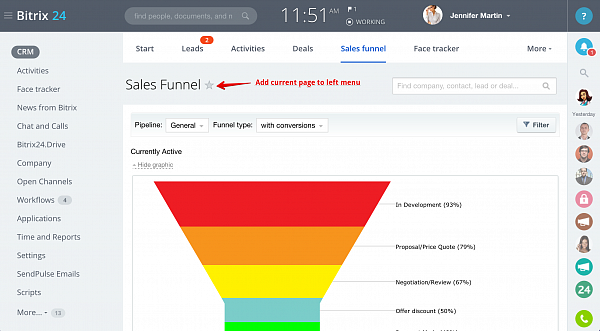 For example, you can make CRM Sales Funnel page as home page for all account users. Create custom menu items – just add menu item name & external or internal link. 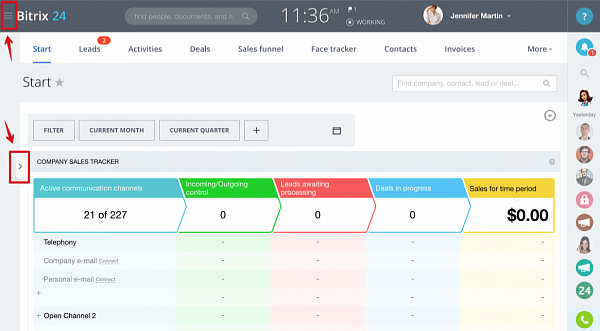 New plus tab for fast & convenient way to add new tasks on the go. Now Bitrix24 administrators can configure left-side menu for all account users – by choosing one of the 3 main scenarios for account (CRM, Tasks, Communication) and with the help of Favorite menu items saved for all users. 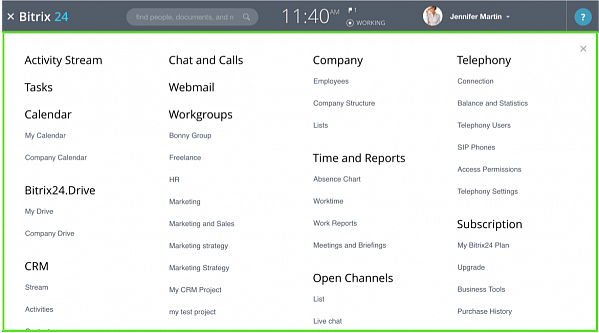 Now each Bitrix24 sections – such as CRM, Drive, Tasks, Company has its own customizable top bar menu. This menu items can be easily reordered, hidden under “More” or set as homepage for this section (you need to set selected menu item first in line for that).